At last, some genuine blight tolerance! For heated greenhouses sow January onwards and unheated/outdoor March-April at a temperature of 16-18°C (60-65°F). Transplant into 9cm (4") pots. 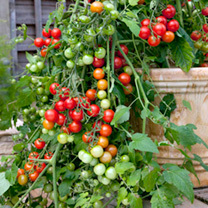 Grow on and for the greenhouse, plant late April-May in large pots, growing bags, or border soil. For outdoors, plant in early-mid June after ‘hardening off’ plants prior to planting. Plant spacing 45cm (18”). Pinch out sideshoots (other than basket or bush varieties) regularly and when in flower tap or shake plants daily to aid set fruit. Harvest July-mid October. HEALTH BENEFIT: A recognised ‘superfood!’ Packed with antioxidants including vitamins A & C and lycopene. Also high in vitamin C, stimulating the body’s immune system. CULINARY HINT: Try slow roasting for 1½–2 hours in olive oil with sea salt and black pepper. Scrumptious!